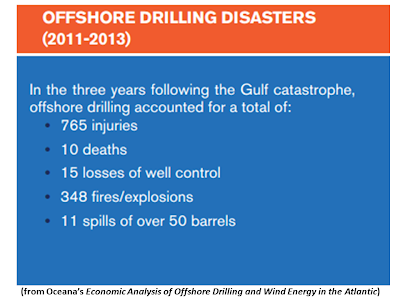 The oil industry has been pushing to expand offshore drilling to the Atlantic Ocean. 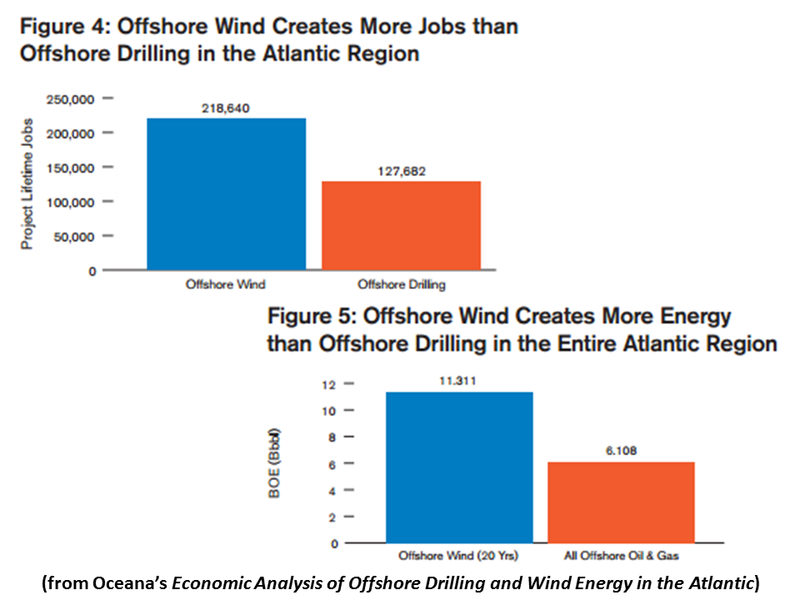 The industry claims that opening the Atlantic to drilling will lead the United States towards energy independence, generate millions of dollars in revenue for states, and create thousands of jobs in the process.1 However, many of the arguments made about the benefits of offshore drilling do not stand up to scrutiny, and the benefits of offshore wind prove to be greater and available over a longer period of time. 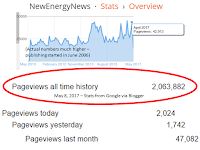 For instance, the oil and gas resources that industry claims will contribute to domestic energy independence would not be extracted until 2026 at the earliest, based on industry’s own estimates.2 This is due to the extensive time it takes to survey proposed areas, conduct exploratory drilling, and build a massive network of infrastructure necessary to conduct large-scale drilling. 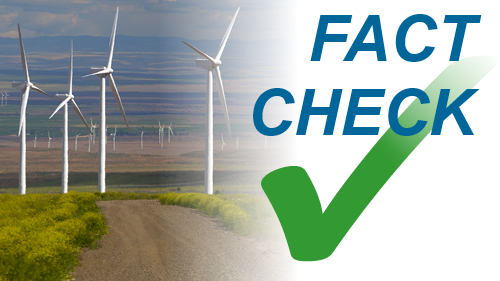 In addition, industry includes oil and gas resources that are not economically feasible to extract, incorporates inaccurate resources multipliers, and assumes a non-existent revenue-sharing system. All of these assumptions result in exaggerated job creation figures. 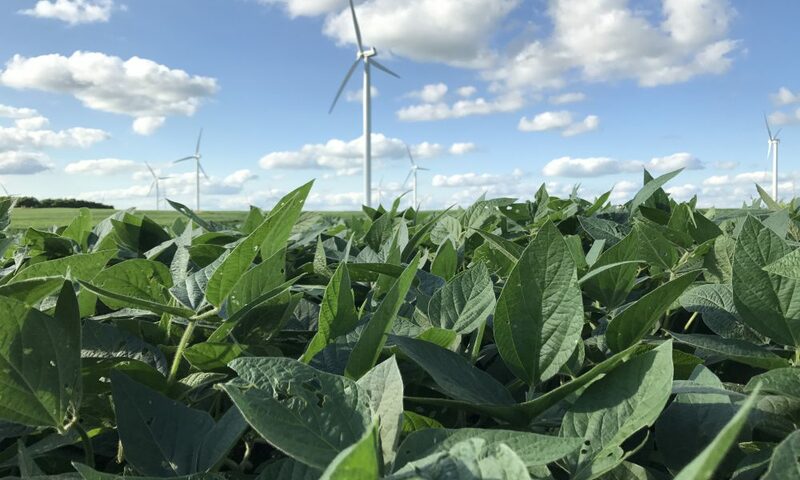 The industry itself projects that the overwhelming bulk of the jobs promised will not be created for at least another decade,3 mainly because commercial production would not begin until 2026. Additionally, the industry and some offshore drilling proponents argue that states will benefit from funding that would come from a revenue-sharing system that currently does not exist.4 As a result, the revenue figures promised are not guaranteed. 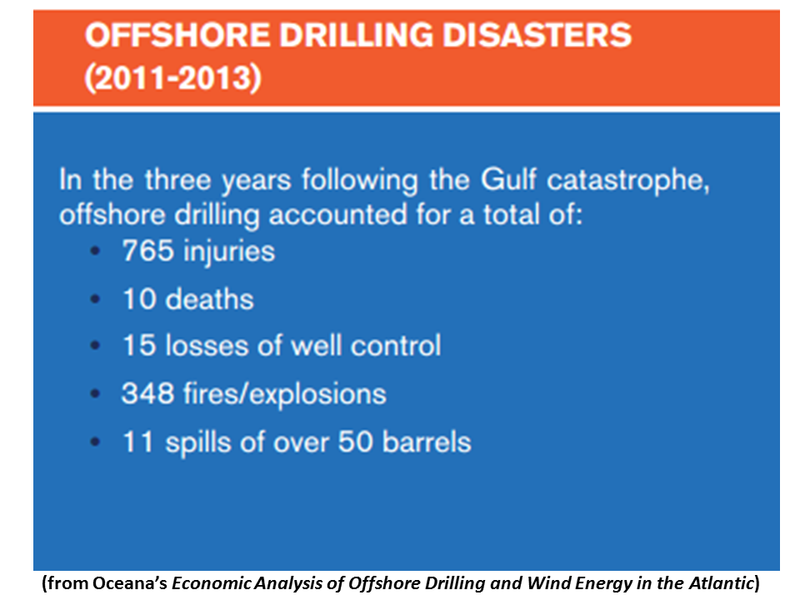 At the same time, if the U.S. moves forward with the expansion of offshore drilling, there could likely be very real and detrimental impacts to the environment and coastal economies. On the other hand, developing even a modest amount of available offshore wind resources would be a far better strategy to lead the U.S. toward energy independence, while generating hundreds of thousands of new jobs. 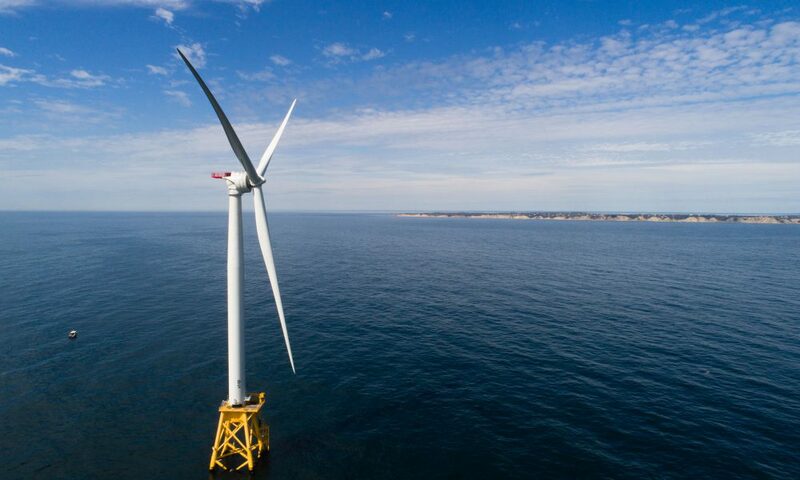 Unlike offshore drilling, offshore wind provides power directly to coastal communities without resulting in pollution, carbon dioxide emissions or spills. 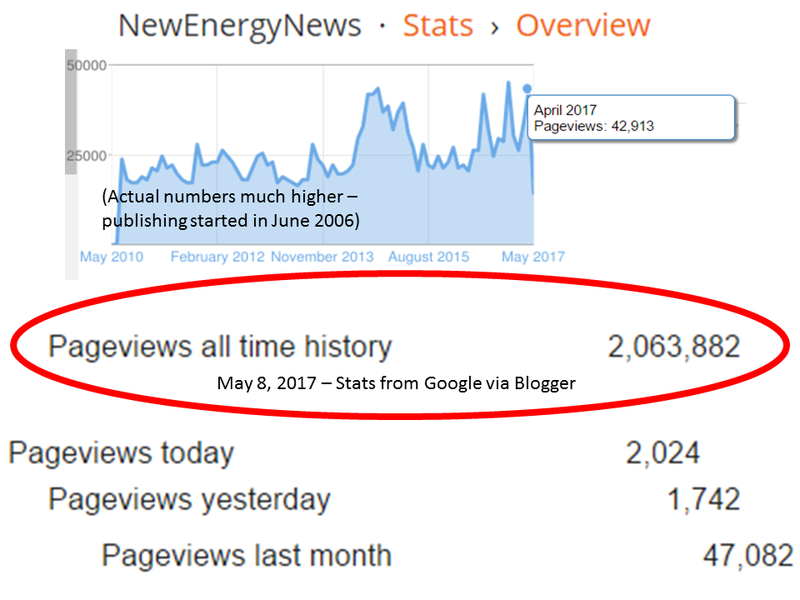 The oil industry’s estimates are often based on unrealistic assumptions about the job growth potential of developing oil and gas. This report compares economically recoverable oil and gas development to conservative estimates of offshore wind development to allow an “apples-to-apples” comparison of the energy and jobs that could be created by each. 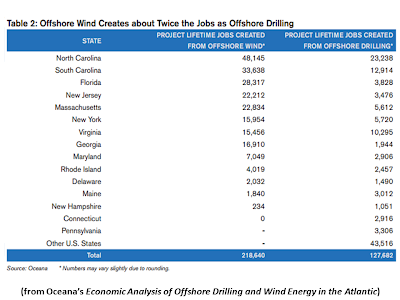 • North Carolina has the highest wind resource and job creation potential of any state in the targeted offshore drilling zone on the Atlantic coast. 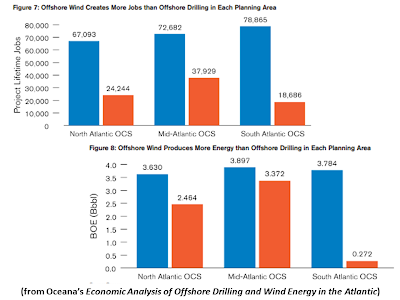 A modest development of our domestic offshore wind resource would offer benefits that cannot be matched by offshore drilling. Offshore wind has the potential to generate more jobs, produce more power, and lead to a higher degree of energy independence than offshore drilling for oil and gas. 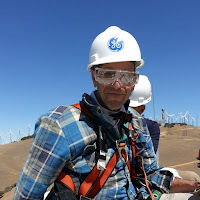 In addition, offshore winds blow strongest during the day and at other times of peak demand, providing a critical clean energy power source to the grid when it is needed the most. 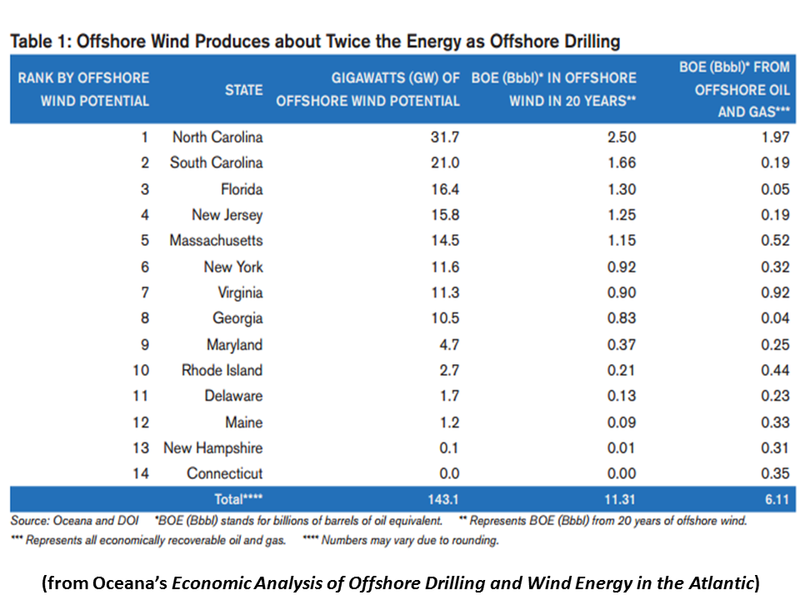 Perhaps most importantly, however, offshore wind development could help the U.S. transition away from fossil fuels and toward clean and renewable energy, a necessary shift given the widespread adverse impacts of offshore drilling, including those related to climate change. 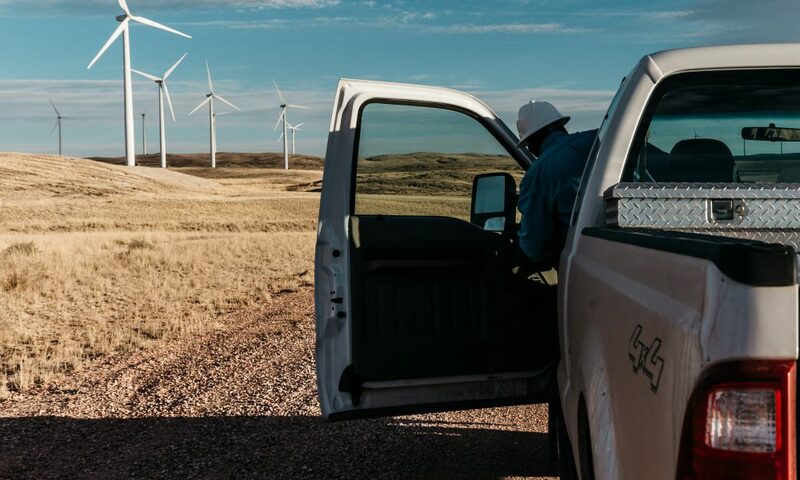 The oil and gas industry advocates strongly for more drilling in undeveloped areas, promising strong benefits for job creation and energy development. 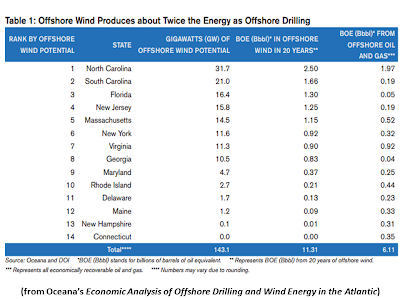 This report provides a realistic picture of what offshore drilling could provide for the East Coast by comparing the oil and gas industry’s projections to similar projections for what could instead be provided by offshore wind. 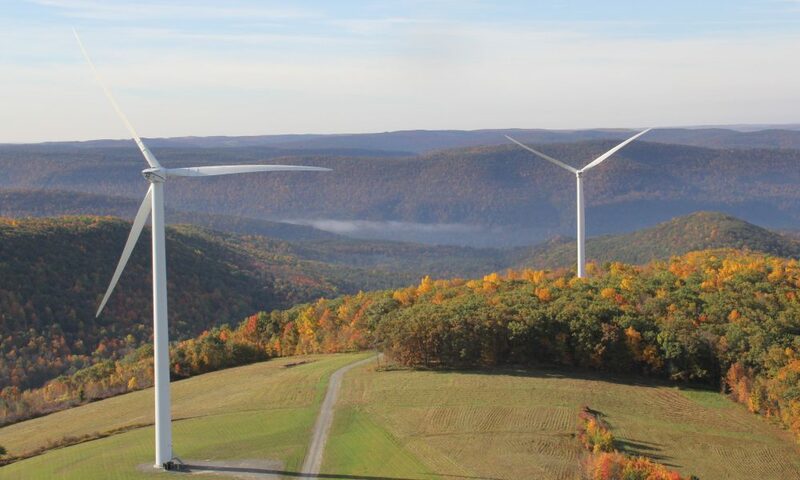 We demonstrate here that the development of offshore wind benefits the economy, coastal communities and the environment more than the development of offshore oil and gas resources in the same region. 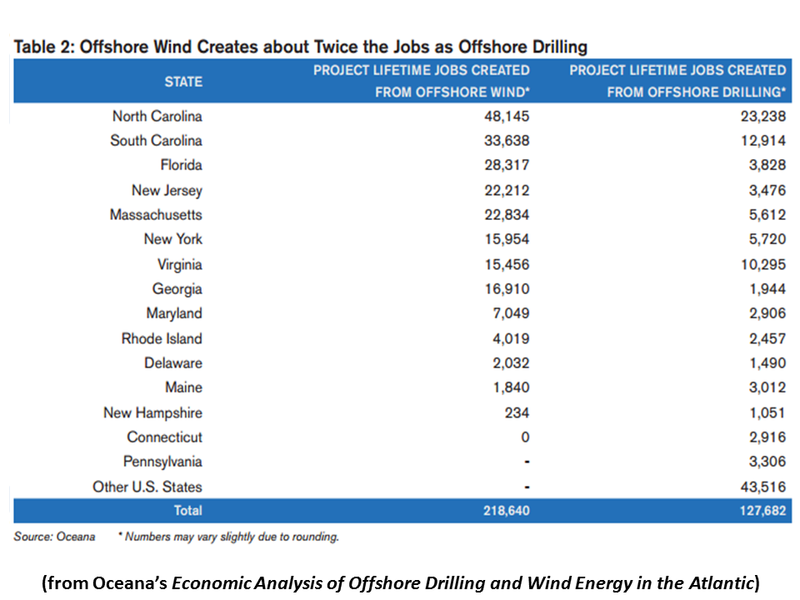 Specifically, wind could create more than twice as many jobs, and in 20 years, it could produce more than twice the energy, as measured in billions of barrels of oil equivalent (BOE), as would offshore drilling (Tables 1 and 2).